If I were to light a cigarette in the central London office where I work, would it be ok? It’d be pretty absurd right? I mean for one, I don’t smoke. But more to the point, it’s illegal. And more than that, it’s really socially unacceptable. We know the harmful effects smoking and second-hand smoke have on our health. And because of this, employers have a responsibility to prevent employees from smoking at work. But this wasn’t always the case. 20 years ago, banning smoking in the workplace was considered a ‘radical’ idea, because smoking was everywhere. You could smoke not only in offices but in schools, in restaurants, on planes, in shops, in cinemas, in bars and pubs, in hospitals, on buses and trains, everywhere. It was normal. Just as using plastic is normal. It’s in all the places I just mentioned. We don’t even realise, because we are so conditioned to it surrounding us. Don’t get me wrong, plastic is an incredible invention that has revolutionised the world and how we live. It has its purpose. But like smoking, plastic is harmful. To our health, economies, and the environment. Many chemical additives that give plastic products desirable performance properties have negative human health effects. Exposure to these chemicals during manufacturing and through plastic package leaching has been linked to adverse health effects including cancers, birth defects, impaired immunity, endocrine disruption, and developmental and reproductive issues. A recent study of stool samples from individuals across eight countries found every sample contained micro pieces of plastics. In some cases, nine different types of plastic were found in a single sample. The world produces nearly 300 million tonnes of plastic per year. That is the entire weight of the earth’s population combined. It is estimated that 50 per cent of plastic is used once and thrown away, and 91 per cent of plastics are not recycled. Poorly managed waste can have a detrimental effect on economies, creating healthcare costs, productivity losses, clean-up costs, and social inequality. Plastic hugely impacts the environment. Ineffective waste disposal leads to pollution of surface and ground water. It has a devastating effect on seas and oceans with more than 90 per cent of marine plastics coming from land-based sources. This plastic pollution harms wildlife. Turtles mistake floating plastic bags as jellyfish and eat them, fatally blocking their guts. Birds confuse small plastic toys, bottle caps, lighters and other items as food and ingest them, dying as a result. Seals get plastic rings stuck around their necks or become entangled in plastic debris, causing severe injury and drowning. Just last week, a dead whale that washed ashore in Indonesia was found with 1,000 pieces of plastic in its stomach, including 115 cups, 25 bags, four bottles, two flip flops, and a nylon sack. Plastic never fully biodegrades. Instead, plastics photodegrade. They break down under UV light into smaller and smaller pieces to the microscopic level. As they do, any toxic additives they contain are released into the environment. They seep into water, into the sea life, into the plant life; into everything. These tiny plastic pieces, known as microplastics, break down further and persist unseen in the deepest layers of the environment indefinitely. At this very moment, one in three fish caught for human consumption contains microscopic plastics. So, if you eat fish, you’re eating plastic. Our over consumption of plastics and in particular single use plastics – remember 50 per cent of all plastic is single use – is having a devastating effect on the entire planetary ecosystem. And, not so-fun fact, more than half of the world’s oxygen is produced via phytoplankton photosynthesis which occurs in the ocean. So, if these phytoplankton cannot survive due to plastic pollution, neither can we. Learning the facts and realising the magnitude of our plastic problem can be daunting. But there are ways we can all make a difference; and businesses are particularly well placed to drive positive change. Here are five ways to use plastic purposefully in the workplace and reduce plastic pollution. Your team needs to realise the importance of tackling plastic waste. But this isn’t about guilt tripping your colleagues into reducing their plastic consumption. It’s about creating awareness, suggesting easy alternatives and inciting a desire to be part of a global movement for the better. 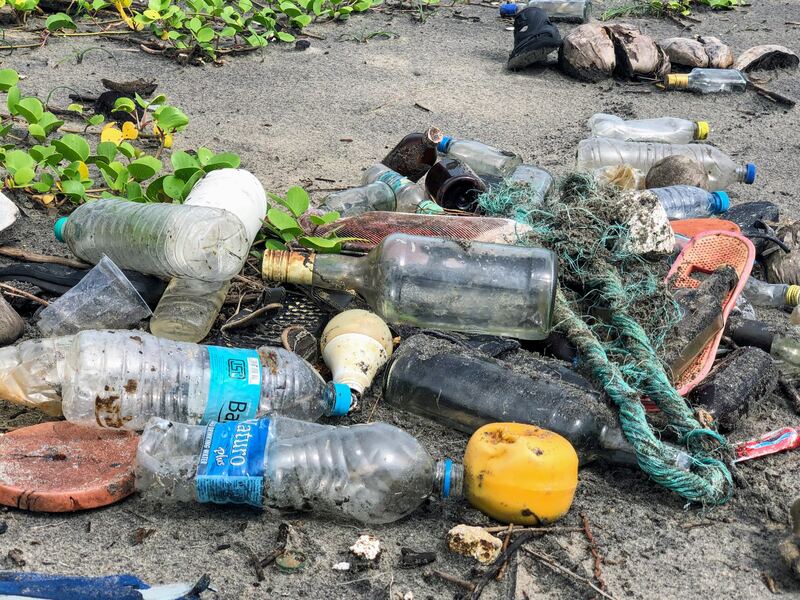 Like the tonnes of plastic in the sea, there is a tonne of informative podcasts, interviews, resources and films on this issue which can be shared with your team. Engaging with like-minded communities and organisations and signing up to be part of initiatives like plastic free July are also good ways to increase awareness. Conducting an audit of the current suppliers and products your office uses for printing, catering and office supplies is a great way to reduce plastic waste. Your office can then develop a procurement policy that ensures future suppliers source goods and services that are produced sustainably, can be recycled or reused, and don’t require excessive packaging. Two and half billion coffee cups are thrown away in Britain every year alone. Providing reusable coffee cups for your team is an easy way to contribute to reducing this number. When given a reusable cup, each team member could sign a plastic with purpose manifesto, committing to reduce their use of plastic and to saying no to single use plastics. Look into what can be recycled and how efficient your current waste and recycling management is. 70 per cent of UK office waste is recyclable but only seven and a half per cent reaches recycling facilities. Throwing just a small amount of unrecyclable material into recycled material can cause the entire portion to become contaminated. So, ensuring individuals are aware of the right way to recycle is key. Colour coded bins and decreasing the number of general rubbish bins help too. Holding competitions to see which office, team, or individual can recycle the most plastic or use the least amount of single-use plastics in a month is a good way to keep your team engaged and motivated. By saying no to single-use plastics and consciously adopting alternatives to replace plastics we can create change. This is an ongoing process and it will become easier as more and more alternatives are developed. But there are easy alternatives available now. Most offices with kitchens have reusable cutlery and crockery. Saying no to plastic versions and using these instead is an easy and effective way to combat plastic waste. These may seem like small steps for a huge and easily overwhelming issue, but incremental changes go a long way in creating positive and recognisable impact. We’ve seen massive bans on plastic straws in countries across the globe, the EU has approved a ban on single use plastics, Chile recently banned plastic bags, and new alternatives to plastics are being created every day. Businesses have a key role to play in reshaping plastic’s purpose for the better, so that 20 years from now we can look back and know we were part of a change that was once considered radical.